Wiki’s have got to be the easiest and fastest way to collaborate documents, thoughts, ideas, howto’s etc. In fact, everything I’ve blogged about is mostly cut and copied from my own personal Wiki I maintain on my private network to help me keep track of things. MediaWiki is a free software open source wiki package written in PHP, originally for use on Wikipedia. It is now also used by several other projects of the non-profit Wikimedia Foundation and by many other wikis.. There are tutorials everywhere for this; why make another? As an administrator/developer myself, I like to eliminate as many steps as I can and make things as easy as possible. I also like to let the operating systems chosen package management software do most (if not all) of the work if possible. So unlike other tutorials; this solution will do most of the work for you out of the box. I have packaged a self installing RPM that prepares MediaWiki along with some useful extensions. Package management and version control is the real seller I think. # i'm going to refrain from explaining this step. # to direct link to a google drive location). Apache configuration placed in: /etc/httpd/conf.d/mediawiki.conf and can be previewed here. WYSIWYG Extension is additionally packaged as an extra for those who wish to use it. The installer will give you the option of adding this. I’ve already applied all of the necessary patches they’ve listed on their website to make it work correctly with MediaWiki v1.21.2. You can view the patch files I created here and here. Keep in mind that MediaWiki requires a bare minimum of PHP v5.3 (and a minimum PostgreSQL v8.4 for those database fans like me). These packages are all available to CentOS 5 users right out of the box and Red Hat 5 users through the EPEL packages. Identified below outline the 3 steps necessary to get up and going. First thing is first, you need to choose a database back end. This tutorial will use PostgreSQL because to me, that is the best and most underrated open source database available today. That said, I’ve identified how to install the other open source choices below. You’ll need to have satisfied at least one of the below options before you can proceed. #       required the call it the first time. Your installation will not change that significantly if you did not pick PostgreSQL as your chosen backend identified above. In fact, it may even be easier to install since other databases have fewer security restrictions. You can still follow through with the actions explained below. # the --nogpg check yum will tell you it can't install the package. # your database during the setup stage. You MUST complete ‘Installation Step 2 of 3’ defined above or you’ll receive this error message! Your screen does not have to look exactly like this; but the most important part is where it tells you that “The environment has been checked. 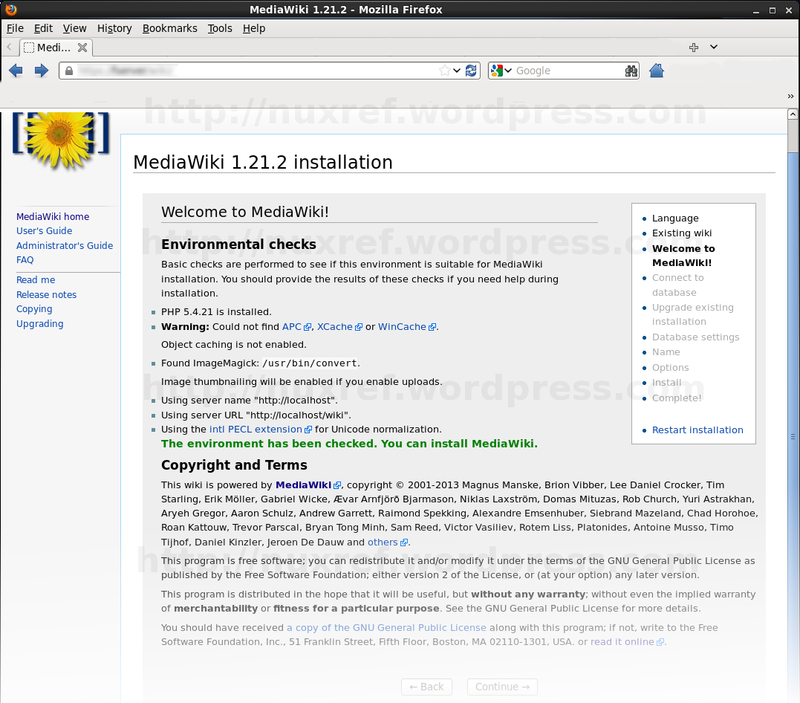 You can install MediaWiki”. If you’re reading this far, then you’ve completed both of the installation steps above. Now we want to configure MediaWiki which is now already available to you. You can access it by opening a browser and visiting: http://localhost/wiki. Alternatively, if your doing this remotely, substitute localhost for your sites hostname or IP address. You should be presented with a webpage that looks similar to the screenshot presented here. You’ll want to click on the link that says complete the installation to set the Wiki up for your environment style. Follow through the wizard answering all the questions asked of you. If you’re unsure of any answers to the questions being asked, usually the default answers are satisfactory enough. When you’ve completed the wiki’s installation wizard, it will ask you to save/download a file entitled LocalSettings.php. This file contains all the information the wiki needs to work with. You MUST download this file and copy it to /usr/share/mediawiki. # directory; This step is crucial! # Update it's permissions for security sake! You can access your wiki and record and collaborate information to your hearts content! The Apache configuration file that is included with this bundle is smart enough to detect the LocalSettings.php file and switch to it’s full out Wiki mode. Now when you visit your website (http://localhost/wiki) you can begin molding it to your liking. Note that the Apache configuration file included additionally adds support for colons (:) in your wiki paths. This allows you to create wiki’s such as: http://localhost/wiki/MySpecialWikiPage:That:Uses:Colons. Colon’s really make it so your wiki can mold and organize itself like the most popular wiki (Wikipedia.org) website used today. Store your LocalSettings.php you recently downloaded along with the mediawiki rpm package somewhere safe so you can always easily recover. Since this blog was written newer versions of MediaWiki came out along with my repository I host. For those who want to update to the newer version (or just starting out and want to fetch the latest version) you can get it there. Just note that I scrapped the WYSIWYG plugin and all the patches I made for it in this release. I did this simply because it’s just getting too dated and no one is updating it anymore. If it’s the first time reading this blog or you’re retrieving MediaWiki for the first time, then this blog and it’s content still applicable (except WYSIWYG references) to the newer version. # I didn't have any problems at all, but it doesn't mean you won't. # Better safe then sorry... right? I used mediawiki.org and view the ideal setup configurations as well as read through peoples notes and work arounds. Note: At the time this blog was created v1.21.2 was the current stable version, so that is what was packaged. WYSIWYG Extension is also packaged in the RPM I provided. I created 2 small patches using the comments here and here. This entry was posted in Linux HOWTO and tagged Apache, Centos, MediaWiki, MySQL, PHP, PostgreSQL, Red Hat, RHEL, RPM, SQLite, Wiki, Wikimedia Foundation on November 5, 2013 by l2g.